The rest of the calls are lost because the system is overloaded, or because*callers hang up after being put on hold. That lacklustre performance — during the*relatively slow post-2016 period, when EI claims were falling sharply across Canada — is weaker even than the results Service Canada says it has achieved. "When senior management … finds itself facing call volumes it is unable or unwilling to staff and provision for, they typically move to a strategy of customer call avoidance," said David Filwood, a call centre expert and critic of government-run operations. The strategy "includes far longer hold times than a consumer would ever experience from a private call centre … with mazes of monotonous computerized voices … that leave callers floundering in voice mail jail,*unable to reach a live human." 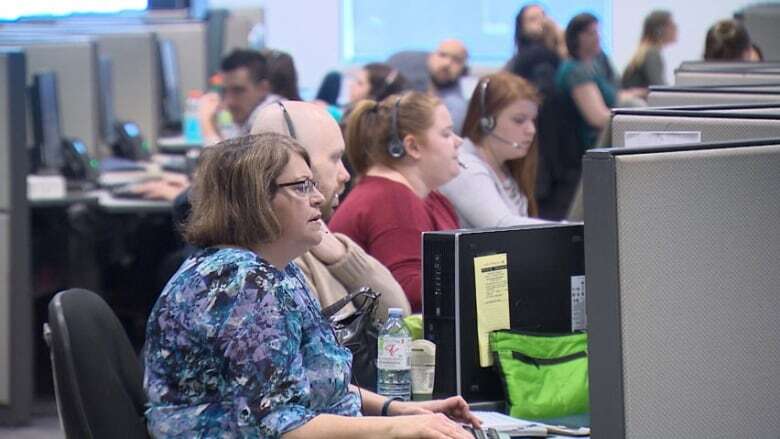 Service Canada operates 10 so-called EI Specialized Call Centres from St. John's, NL, to Vancouver, staffed by about 1,425 people. The 2018-19 budget for the centres was $83.8 million; most of that money goes to*salaries. The system has been underfunded for years, according to the consulting firm*PwC Canada, which produced a report on the system in 2016. On April 1, 2014, the agency moved the goalposts, stretching the three-minute window*to*10 minutes and acknowledging that the earlier standard was unrealistic. Service Canada currently can't meet even that relaxed standard; only 67 per cent of calls got through to an agent within 10 minutes in 2018-19, down from 73 per cent the year before. But the investments still have not solved the problem of so-called "blocked calls"*— calls made*to agents that were lost because the overloaded system couldn't even put them*into a queue. There were 3.1 million of these lost "blocked calls" in 2018-19*— along with another 979,761 calls that did get into a queue but were lost because their callers hung up*before they could speak to an agent. In a 2017 report to Parliament, Canada's auditor general cited the same "blocked call" problem at Canada Revenue Agency (CRA) call centres, where agents are required to answer calls within two minutes. "We found that the Agency blocked more than half of the calls it received (about 29 million out of 53.5 million) because it could not handle the volume," said the report. "Blocked calls were those that did not reach either an agent or the automated self-service system." By ignoring "blocked calls," the CRA was able to claim rosier results for its call centres, the auditor general found. "While the [CRA] reported that it met its targets … its performance measures were incomplete and its call centres' results were overstated." Service Canada was alerted to its own "call blocking" problem in a 2016 report it commissioned from consultants PwC Canada. "… accessibility (being able to get through to a call agent) is still a factor that must be addressed, i.e., reducing call blocking," warned the $700,000 report, obtained by CBC News under the Access to Information Act. But the agency did not include in that calculation calls that were abandoned in the queue by callers who, in some cases, waited longer than 10 minutes to speak to*an agent. Department spokesman Christopher Simard also said most EI callers use an Interactive Voice Response (IVR) system — the first stop for all callers, including*those wanting to speak to an agent — to get answers without needing*to talk to a human. Filwood, principal consultant with TeleSoft Systems in Nanaimo, B.C., says Service Canada also needs to improve its workforce, since its agents typically need to be rotated out after three to five years because of burnout from*dealing with rude, angry and abusive callers. "All CSRs [customer service representatives] have an expiration date," he said.